You’re at your local drug store, standing in front of the toothpaste aisle. You’re faced with a bewildering array of choices. Should you go for tartar control? How about extra-whitening? What flavor should you choose? Does it even really matter? Toothpaste is a multibillion dollar industry, but what is toothpaste made of, anyway? And what are the differences between the different types of toothpaste? Let’s have our Yuba City dentists help you take a closer look. Abrasive agents: These scratchy materials remove food, bacteria, and surface stains from teeth. They also make the mechanical action of brushing more effective. Detergents: Materials like sodium lauryl sulfate (which is also found in various soaps, shampoos, and yes – laundry detergents) are responsible for the suds and foam that you produce when brushing. They break up and dissolve substances that are otherwise difficult to wash away. Fluoride: A natural element, abundant in the earth’s crust, fluoride is also a key ingredient found in most toothpastes. It is scientifically proven to strengthen tooth enamel and prevent decay. Thickeners: Gums and some seaweed extracts help maintain a toothpaste’s texture. Flavoring: Artificial sweeteners are often added to toothpaste to improve taste. Popular flavors include mint, cinnamon, baking soda, lemon-lime, and bubble gum. 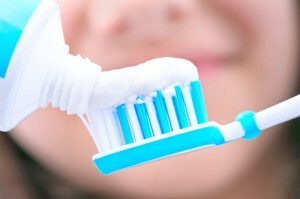 Additionally, most toothpastes also contain preservatives, binders, and other ingredients. These keep the gels and pastes from drying out or separating. Tartar control toothpaste: The primary purpose of brushing teeth is to remove plaque, that sticky biofilm containing acid-producing bacteria that harm teeth. If plaque isn’t removed promptly, it hardens into a material called tartar. Tartar is much harder to remove than plaque. A continuous build up of tartar on your teeth and beneath your gums leads to gum disease. Some toothpastes claim to reduce tartar buildup by using special chemical compounds such as pyrophosphates and zinc citrate. Others contain an antibiotic called triclosan, which kills some forms of oral bacteria. Our dentists do not recommend triclosan toothpastes for most patients, as antibiotic overuse is a serious problem and it does create resistant “superbugs” over time. Whitening toothpaste: These toothpastes contain special enzymes or abrasive materials that are designed to bind to stains and remove them. However, it’s important to know that whitening toothpaste is typically only effective against surface stains. It also works far less well than a simple visit to the Yuba City Dentistry Group for tooth whitening. Toothpaste for sensitive teeth: If your teeth are easily irritated (for example, by hot or cold food or drinks), you might opt for one of these toothpastes. Using chemical compounds such as potassium nitrate or strontium chloride, these toothpastes block sensations of pain; however, it usually takes some weeks before noticing their effect. Whichever toothpaste you choose, make sure it has the American Dental Association (ADA) Seal of Acceptance. This guarantees that the toothpaste contains fluoride, and has been evaluated for safety and effectiveness by an independent review board of experts. With so many options for toothpaste available, why not try a variety and find the one you like best? This helps you stay motivated to keep up with your daily routine of brushing – and keeps your teeth looking and feeling their best.